When I left the stadium, some of my friends, we talked a little bit about the game, not too much. It’s good to talk about it. A little surprised, a little shocked. Grabbed something to eat at some diner near the hotel. It took a little while to fall asleep. I was in shock more than anything. It was like, I couldn’t believe it, did that really happen? We’ve been on the other side before, so we know how it feels to lose and we know how it feels to win. Joe had a meeting before we went out to the field and just told us to take it one game at a time. You got to win one to win two, got to win two to win three. It’s a one-game series for us, that’s how we have to think. We get back home, I like our chances, I like the way we play there. Our mood is good, man. I’m going to check out a haunted house tonight, supposed to be pretty scary. Can’t sit in the room all night and just think about last night’s game. Sleep in a little bit tomorrow, get some food, chill out. Same routine, nothing’s going to change. Everybody has faith in us. My friends tell me to keep your head up. This is the right team to come back from 3 to 1. I’m good. I’d be way more looser if it was 2-2 going into tomorrow, because we hit Cole pretty good the first time we played him. But this is just something we have to deal with and fight through it. In the clubhouse now — our workout just ended and I’m watching the OU-Texas game. It’s looking bad now for my OU boys. Five turnovers, terrible. And they’re still trying to run the ball — negative 14 yards in the fourth quarter. We need to go to something else. It’s not working. They’ve got a young buck in their QB. Bradford hurt himself. It’s not looking good right now. This is the most sloppy OU game I’ve seen in a long time. This is what we do on Saturday, chill around, watch some footbal before we play. Everybody is watching their team play — no one around here has Texas. George Sherrill and myself are OU fans. No Texas boys here. Clayton Kershaw likes Texas Tech. OU, they’re making a lot of mistakes today. You can’t make mistakes and expect to win, that goes for football and it goes for baseball. We haven’t made too many mistakes and we can’t afford to if we’re going to win this series. Let them make the mistakes and we’ve got to capitalize on them. Fans here, they’re rowdy man. Just like we had on our side in L.A., their fans are loud, too — just as loud as our fans. Fans can make it hard. I don’t know if it’s pressure, but it might rattle you a little bit. We know how to go into it. Last year, I think the Phillies found ways to win and it wasn’t about the fans. The outcome was always in their favor. This year, it’s different. What happened last year makes us want it even more this year. We need to score quick, what we did in St. Louis and what we did in Chicago last year. With Philadelphia, you’ve got to keep scoring. Look at them yesterday. They scored one run, but they didn’t keep scoring and we stayed close and won it late. The weather, I don’t think it will be that bad. We have to play in it and they have to play in it. They’re not really used to it any more than we are, maybe a little earlier in the year. Once you get moving around, you don’t worry about the weather, you just worry about the win. So, tonight I’m going to get some dinner, watch the South Carolina-Alabama game and go about my business. We’ve got a lot of time to chill until the game tomorrow night. It was kind of frustrating the way we hit the ball tonight. We worked their starter and got him out of the game and had a good chance of winning. We probably should have scored more runs. They got the key hits and walks in big situations. We played pretty well, that’s just the way baseball is. We have to come back tomorrow with the same swag and do it over again. It was a battle of the bullpens. We hit, they hit. They just won tonight. You can’t just score one run and think you can beat them. I’m not worried about Clayton Kershaw, he just lost his groove for a second. He’ll bounce back and do even better than he did tonight. I like the way we kept coming back. We don’t ever give up. That’s the mentality that had us win 95 games and we have to have the same mentality tomorrow and try to get a win. I like our chances with Vicente Padilla. He pitched well in St. Louis. We’ve just got to hit the ball and get some runs for him. The Phillies haven’t changed a bit. They find ways to win, like we do. We’ve got to find a way to get more wins than them. We came in as underdogs and had to prove everybody wrong. And that was a really good team we had to beat. They sent three great pitchers out there. And we proved we can beat No. 1 starters. We’re feeling really good about ourselves right now and we got to take it to the next round. Tonight it looks like Manny’s gotten going. He looks good at the plate, he’s driving in runs. When you see that, you know we’re going to have a good game. I think we’re better this year than last year. Like me, I didn’t have a good game at the plate. But ‘Dre picked me up and Manny picked me up. We’re a better team this year because we’ve got guys to pick up other guys. People say we don’t have real good pitching. I don’t know, our pitching was pretty good in this series. And Raffy, he brought his A game. So it’s a whole different team than last year. That’s why we’ve been talking since the beginning of the year that we expect big things. So we’re popping champagne in the clubhouse tonight, but we still have a long road, we’ve still got eight games to win. 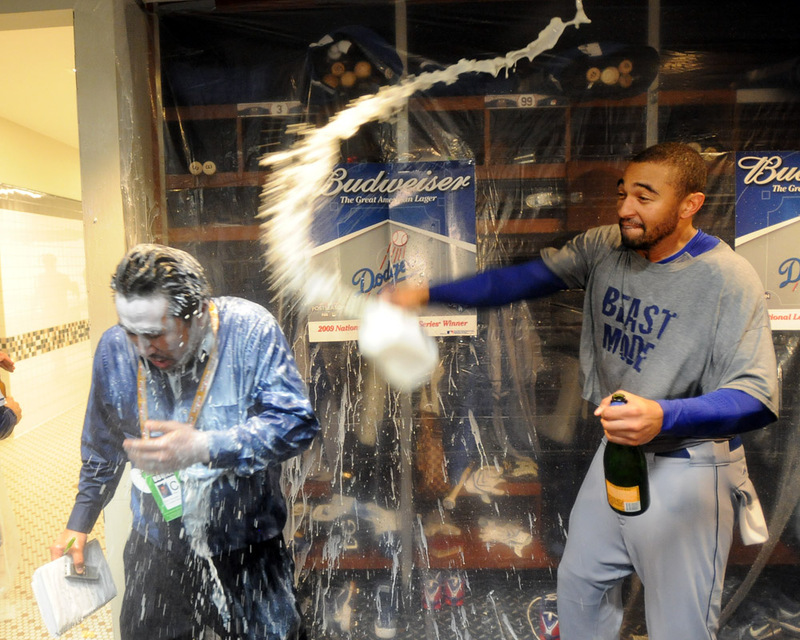 We’re going crazy in here right now and I hope our fans are going crazy, popping champagne and waving the towels and I hope they’re ready to go to the stadium Thursday, because our fans are one of the big reasons why it’s so hard for other teams to come to L.A. and play the Dodgers. Man, can you believe that game last night? I mean, we’re still talking about it in here. It was amazing. For me, it was the most exciting game I’ve ever been a part of. When the game ended, I went straight for Mark Loretta. I was on the middle of the top step (of the dugout). I knew something good was going to happen. I had a feeling. And Loretta got that hit and I went for Loretta. We were all surprised what happened to Matt Holliday, dropping the ball. We still thought we had a chance to win. Around the stadium, they made posters of us, talking about the comeback kids. And things like that really showed we keep fighting till the end and never give up and we got the win. It carried over to the plane a little bit, but then everybody did their thing, maybe a game of cards or a movie or whatever they do on a plane, because it’s a regular plane ride and we still have one more game to win and it’s not going to be easy. Definitely not easy with the offense and pitching that team has. It’s two good teams going at it. All we got to do is keep the same approach of the first two games and make the pitcher work and keep them from scoring. We’re loose today, just like when the playoffs began. It’s a little rainy today and you get a little sluggish, but we’ll be up for the game. The pressure’s not on us, it’s on them. Now I’m going out to eat with O-Dog and Loney and chill. Maybe we’ll watch the Angels game. My boy Torii went deep yesterday. I was watching on the plane and was pretty excited about that. He was pretty pumped about that. I shot him a text. Told him to pull this thing off and try to make it a little L.A. thing. That would be exciting. We’ve been doing this all year, you know that. We’ve been coming back all year. It shows the character of our team. Now that’s two wins and one to go. It shows we can beat the best pitchers in the league and we definitely proved that the past two days and we got another tough pitcher on St. Louis and hope we can wrap it up Saturday. I’m sure for the opposing side, it’s hard to play, but it pumps us up. Now we have to go there and listen to their crowd. We just have to be relaxed and grind out and get the job done. Nothing we do surprises me. We’ve come back a lot this year. We showed we never give up. It’s hard to beat a team like that. Ninth inning, we thought we had a chance. We got to their bullpen and got it done. I gotta say, the ball off Loney’s bat, I thought it was over. But you never know, with all the towels waving. It was tough to see off the bat out there. And when it was over, on the field it was awesome, man. I don’t want to get too excited, but at that moment that was the most exciting moment of my life in baseball right there. It feels good, man. Really, you can’t describe it. That was the loudest I’ve ever heard a crowd at Dodger Stadium.